We understand that creating video is not a main priority when it comes to your business. It takes time. It costs money. You don’t have the resources. However, all those excuses are void when it comes to Lumen 5. Lumen 5 lets users create unlimited videos using millions of free media files. With this simple and free video creation platform, you can create professional, engaging video content within minutes. The A.I. enables anyone without training or experience to easily create videos from an online post, or even from scratch. The text-to-video technology intelligently matches the media to the content. Lumen5 artificial intelligence system can create a video from a blog post or RSS feed. It will automatically fetch the content, summarise it, and match it with relevant videos, photos, and music. If your content is offline, simply copy and paste your text to begin building your video. The Lumen5 media library contains millions of free files. The media can be easily found in categories or through a quick search in the library. 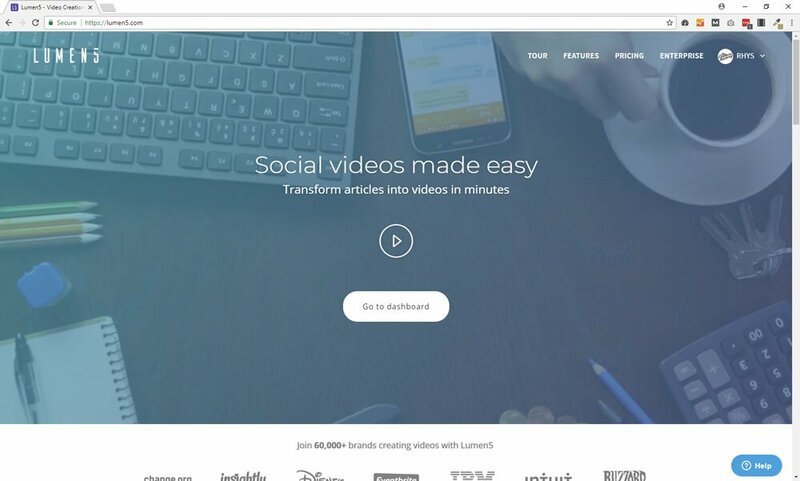 Even if you have no knowledge about creating video, Lumen 5 is here to help. The video length is automatically determined by the amount of text within the scene. The position of the text is dynamic based on the media used, ensuring the font is always visible. Specific keywords are highlighted. If you’re not happy with the text, or the video, you can manually edit it. Just drag and drop to edit! With Lumen 5 you can customise every video with your own branding by uploading your own logo and watermark. A colour can be chosen from the pre-sets, or you can enter your own custom hex code. Choose from a number of fonts or upload your own custom typeface. You can even insert your own photos & videos. You can even add a call to action at the end of the video! Not only can you embed these videos into your website, you can also post them onto your Facebook Page and receive 10x higher reach! Or even Tweet it to receive 6x more video retweets than photos.